The restoration of Mayslake Hall might appear to be a daunting task at first glance, but like most challenges, this one also has a silver lining! The Forest Preserve District encourages our visitors to experience the restoration process firsthand to bring this building back to its previous splendor. Over the past few years the Forest Preserve District, private donors and grants funded interior and exterior condition surveys at Mayslake Hall. These surveys identified priorities and specific techniques and materials to be used to meet the U.S. Secretary of the Interior’s Standards for Rehabilitation and will be in compliance with the Illinois Historic Preservation Agency requirements for landmark properties. The restoration will be completed in phases, as funds become available. To date the entrance gate, part of the servant wing exterior, solarium, living room, library ceiling and back courtyard have been fully restored to their former glory. Next on the docket are the restoration of the grand staircase and sleeping porch. This phased approach has opened unique opportunities to provide students in the preservation field hand-on learning experiences. In an era when first impressions were important, the entrances of residences such as Mayslake Hall needed to wow visitors while affirming the social status and wealth of the owner. Architects created staircases with richly carved perforated strapwork with balusters and newel posts (two types of individual support posts). 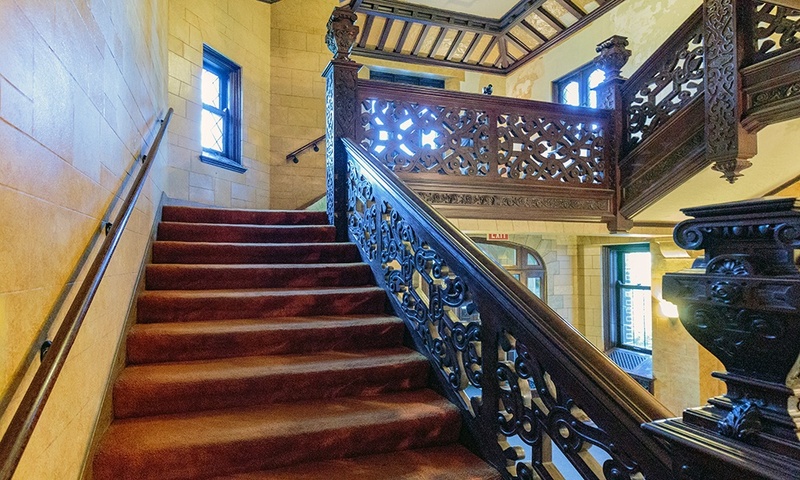 Mayslake Hall’s central walnut staircase looks remarkably similar to the staircase at Aston Hall in Birmingham, England, a premiere example of Jacobean style, completed in 1635. Our staircase is an excellent example of the Tudor revival-style, making it the single most important architectural feature of the mansion. Its restoration will include repairing and refinishing all the woodwork on the staircase and balustrade, stripping the marble baseboard and installing a period-appropriate runner. The Friends of the Forest Preserve District of DuPage is currently raising funds for the staircase restoration. The hall’s living room served as a place for living, events and worship (the Franciscan friars used the space as a chapel at one time) for more than 90 years. Grey and mint-green painted walls, aluminum windows and a water-damaged ceiling were all in desperate need of restoration work. The Forest Preserve District determined the scope of work, solicited bids and awarded contracts to start the stucco-duro ceiling (applied, molded plaster) project. First it needed to be stripped of countless layers of paint that obscured many details of the original work. Some areas where damaged beyond repair and several new molds needed to be created. Analysis determined that the color was not the expected white but a dark buff. Today this color adds to the experience as you enter the room and pulls your eye up to the beautifully detailed ornamental plaster. The original architectural drawings by Marshall & Fox specified “hand-worked” plaster on the living room walls. This type of Old English plaster is intended to resemble 16th-century English plasterwork. Microscopic analysis revealed that the plaster mix had a dark sandlike color. After numerous test panels and discussions, the restoration specialists settled on the final color and best restoration method, which resulted in the walls being skim-coated and finished with a lime wash to replicate the original variegated finish. All 200 original windows and doors around Mayslake Hall were leaded glass. Like many others on the first floor, the living room windows and doors were replaced with aluminum in the 1960s. These aluminum windows and the door leading to the back’s grounds were removed and replaced with new ones that were fabricated according to the original drawings. They bring the room back to the Tudor-Revival style originally intended. The nickel-plated hardware, replicated wall sconces and time-appropriate crystal ceiling chandeliers were added to complete the project. Before restoration the solarium was painted gray and sections of Caen stone walls and decorative faux-painted ceiling peeked through layers of peeling paint. The 1960s aluminum windows dominated this space, so we decided to begin the restoration with replacing them. Nine floor-to-ceiling windows invite the outdoors in and connect the interior space to the exterior. The original green color of the trim enhances this design idea. Next were the restoration of the walls and ceiling. The Caen stone plaster on the walls is a faux stone plaster mixed with stone, sand and mica flakes. After it was applied to the walls imitation joints were cut in the surface and filled with Keene’s cement, then rubbed smooth with sandpaper. This treatment resulted in a fine creamy limestone effect with a subtle sparkle to it. Four corner lights were fabricated according to original proposed designs found in original blueprints. The Forest Preserve District thanks the donors who contributed to these projects and looks forward to continuing Mayslake Hall’s restoration for generations to come. To host an event, contact our events coordinator at 630-206-9569 or sbrookes@dupageforest.org. Mayslake Peabody Estate is open to the public only during scheduled programs and events. The surrounding Mayslake Forest Preserve is open daily from one hour after sunrise until one hour after sunset. See more about Mayslake Peabody Estate's volunteer opportunities. Our Mayslake Peabody Estate offers programs and tours year-round. Sign up today!